Born Toronto, Canada, April 8, 1893. She was born Gladys Smith but changed the named to Mary Pickford in 1907 at the suggestion of stage producer David Belasco. She appeared on the stage for the first time at age five, and, with her mother (Charlotte), brother (Jack) and sister (Lottie) spent the next 11 years making a steady living on the stage, although she never became a major star. In 1909, she joined Biograph and began making one and two-reel shorts that cause her popularity with the public to grow steadily. It was her growing popularity that caused Carl Laemmle to lure her away to his IMP company for a short period, but she was unhappy and returned to Biograph. She left Griffith in 1912 and joined Adolph Zukor and Famous Players where she began to make the features that made her the institution she is. Pickford made 34 features for Famous Players (which evolved into Paramount) from 1913-1919 including "Hearts Adrift" (1914), "Tess of the Storm Country" (1914), "Poor Little Peppina" (1916), "The Pride of the Clan" (1917), "Poor Little Rich Girl" (1917), "Rebecca of Sunnybrook Farm" (1917), "Amarilly of Clothesline Alley" (1918), "M'Liss" (1918), "Johanna Enlists" (1918) and a stand-out dual performance in "Stella Maris" (1918). 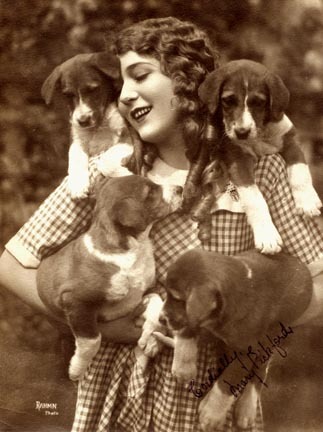 Mary moved to First National in 1919 where she made three films - "Daddy Long Legs," "The Hoodlum," and "The Heart O' the Hills." Then, she, Douglas Fairbanks, Charlie Chaplin and D.W. Griffith joined together to form United Artists. Mary had married fellow Biograph actor Owen Moore in 1911, a marriage of which her mother never approved. The two remained estranged throughout the second half of the 'teens, and, in the late 'teens she fell in love with Douglas Fairbanks. Their love grew as they toured the country in 1918 on bond tour for the war effort. Both obtained divorces from their first spouses and married in 1920 to become the King and Queen of Hollywood as they reigned from the most famous residence in Hollywood - Pickfair. Mary's successes continued into throughout the 1920's - the most popular female star of the movies and also the highest paid. Not only was Pickford idolized in the United States, she and Fairbanks would be mobbed anytime they went to Europe. Mary's first United Artist release was "Pollyanna" (1920) followed by "Suds" (1920) and then three releases in 1921 - "The Love Light," "Through the Back Door" and "Little Lord Fauntleroy." The production schedule slowed considerably during the remainder of the decade as more attention was lavished on her films. All of her films were great successes. She only faltered once with "Rosita" (1923) when she brought in Ernst Lubitsch for the direction and the relationship didn't gel. However, a remake of "Tess of the Storm Country" (1921), "Dorothy Vernon of Haddon Hall" (1924, "Little Annie Rooney" (1925), "Sparrows" (1926) and her last silent "My Best Girl" (1928) were all grand successes. Mary's siblings, Lottie and Jack also entered the movies, but had much less successful careers. Jack, particularly, had an erratic personal life marred by alcoholism and difficult marriages, one ending in a suicide. Both Lottie and Jack died in the 1930's at relatively young ages. Mary made for sound features, the first of which, "Coquette" (1929) brought her a best actress Oscar. A 1929 teaming of her and Fairbanks for "The Taming of the Shrew" proved to be a less than satisfying experience for both of them as the marriage was experiencing troubles at this time. Mary's last screen appearance was a very good movie - "Secrets" (1933) co-starring Leslie Howard. Mary and Douglas divorced in 1936 and she married her "My Best Girl" co-star Buddy Rogers in 1937, a marriage that lasted until her death May 29, 1979.